Welcome Home Series handlesets are the perfect addition to your front door to create a unique and fashionable entryway to your home. Each is stylishly designed to provide maximum-security protection. There are many styles, finishes and configurations from which to choose. Shelburne's curvaceous styling expresses a sense of beauty and elegance. 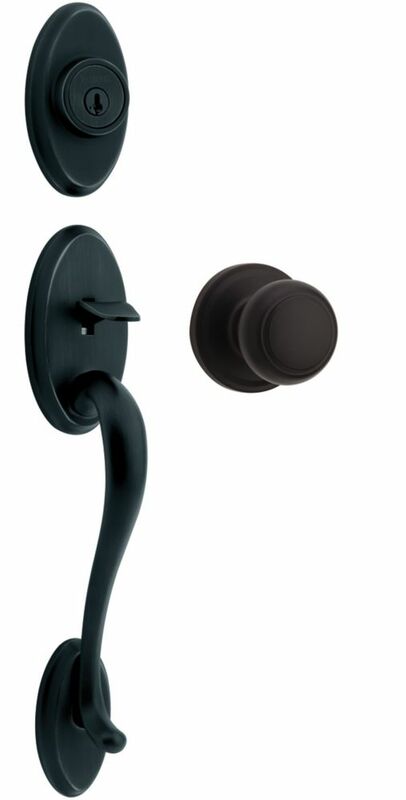 Single Cylinder Handle Set Exquisite design combined with a distinctive profile, the Troy knob executes strength and beauty The rich tones of Iron Black add the finishing touch to this product. The Iron Black finish provides a rich and warm complement to the product's style. This powered scrubber cuts through grime, grease, dried-on food, and sticky messes. It&rsquo;s perfect for your dishes, pots, pans, countertops, stovetop, oven, sinks, and many other surfaces and appliances in your kitchen. It is ideal for dishwashing. The Grimebuster&trade; is fully submersible and the non-slip handle makes it easy and comfortable to grip, even when wet. Attach many different heads to break up even the toughest mess. Inspired by the sleek elegance of modern European design, the Trinsic. Bath Collection completes the look of any contemporary bath, from classic to rustic. Delta. faucets with DIAMOND Seal Technology perform like new for life with a patented design which reduces leak points, is less hassle to install and lasts twice as long as the industry standard*. You can install with confidence, knowing that Delta faucets are backed by our Lifetime Limited Warranty. *Industry standard is based on ASME A112.18.1 of 500,000 cycles. Shelburne Single Cylinder Iron Handle Set with Troy Knob in Black Welcome Home Series handlesets are the perfect addition to your front door to create a unique and fashionable entryway to your home. Each is stylishly designed to provide maximum-security protection. There are many styles, finishes and configurations from which to choose. Shelburne's curvaceous styling expresses a sense of beauty and elegance. Single Cylinder Handle Set Exquisite design combined with a distinctive profile, the Troy knob executes strength and beauty The rich tones of Iron Black add the finishing touch to this product. The Iron Black finish provides a rich and warm complement to the product's style.